Colby Bishop scored twice to take his tally for the season to 16, with Junior English also on target. And, despite the visitors knocking on the door in the second half, wayward finishing and resolute defending ensured the hosts were able to see out the game in relative comfort. Callum Gittings returned from injury for the home side who were also boosted by the arrival of striker Mikey Taylor who slotted in on the bench having made the move from Tamworth in midweek. 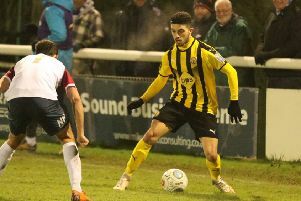 Leamington were on the back foot in the opening stages, however, with John Johnston blazing over after just 30 seconds and Connor Hampson showing excellent footwork in the box to negotiate two defenders only to balloon his shot out for a throw-in. The home side were guilty of being sloppy in possession but their first threatening moment, in the 11th minute, led to the opening goal of the game. Jack Lane does battle with Jordan Hulme, who was later sent off. Jordan Murphy, whose loan spell has been extended to the end of the campaign, unleashed a fierce shot from 25 yards which took a slight deflection and flew past the angle with keeper Anthony Thompson flat-footed. Thompson was more mobile from the resultant corner, rising to palm away James Mace’s goalbound header. Jack Lane picked up the pieces but was unable to work a shooting opportunity and the ball rebounded to Bishop whose backheel was poked over the line by English. The goal was somewhat against the run of play and completely changed the momentum, with Brakes now assuming control of proceedings. Altrincham were looking susceptible to the excellent dead-ball delivery of Murphy and an elaborate overhead kick from English failed to find the target after Jack Edwards had won another aerial duel. James Mace and Jack Lane combine to clear Brakes' lines. Andrew White was then in the perfect place to clear an Edwards header off the line after Bishop had won the initial ball at the far post. Brakes doubled their lead on the half-hour, with Murphy the instigator. The pacy wideman picked up possession just inside his own half and set off on a driving run which took him all the way to the visitors’ box. Murphy had just the advancing Thompson to beat but was unable to pull the trigger as a nudge from the backtracking Hampson sent him tumbling to the turf. Hampson escaped further censure and Bishop meted out the perfect retribution with his spot-kick proving too fierce for the Altrincham number one despite Thompson getting a hand to it. It was Brakes’ first two-goal cushion since the opening week of November and it was to get even better for the home side a minute before the interval. Joe Clarke’s clever return pass allowed English plenty of time to measure up his cross from the right flank and he used it wisely, picking out Bishop who cleverly guided his header beyond the reach of Thompson. Altrincham boss Phil Parkinson introduced Ben Harrison at the interval and he was immediately involved, clattering into team-mate Tom Hannigan who needed lengthy treatment for a wrist injury. A good run from Max Harrop looked to have created an opening for Johnston but the wideman, at full stretch, was unable to keep his effort down. Johnston was again frustrated just short of the hour-mark, with Jordan Hulme opting to try his luck from 40 yards rather than pick him out in acres of space, the shot trickling tamely wide. Brakes were almost gifted a bizarre fourth after Thompson flapped at a cross from the left. 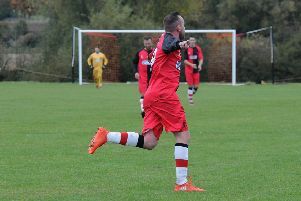 Murphy, arriving at the far post, sent his header towards goal and Hannigan’s clearance off the line hit a retreating Thompson and ricocheted just over the bar. An underworked Tony Breeden comfortably dealt with a shot from substitute Sean Williams, while Jake Moult drilled well over after half-hearted appeals for a handball in the box against Ahmed Obeng. Josh Hancock had a shot deflected for a corner by Jamie Hood as the home side continued to keep Altrincham at arm’s length and the striker then dragged the visitors’ best chance of the match wide of the target in the 76th minute. The home side were managing the game well and their task was made even easier when Hulme was needlessly sent off following an altercation with English, the volatile striker having taken offence to a perceived elbow by the defender on Nathan Waterson. The ten men were unable to even fashion a consolation, Johnston hitting the post from a tight angle after Lane had been caught out by a crossfield pass. Gittings then came close to adding the gloss, ghosting in to get his head on Clarke’s delivery only to be denied by a reflex stop from Thompson. However, the job had already been done in the first 45 minutes as manager Paul Holleran identified. “‘We’re really delighted with the result,” he said. “I think the first half, although we perhaps had a slight advantage with the conditions, was a fantastic 45 minutes. Brakes: Tony Breeden, Junior English, Jack Lane, Joe Clarke, Jamie Hood, James Mace, Jordan Murphy (Connor Taylor, 79), Callum Gittings, Colby Bishop (Mikey Taylor, 86), Jack Edwards (Sam Wilding, 82), Ahmed Obeng. Subs not used: Reece Flanagan, James Bowen. Altrincham: Anthony Thompson, Andrew White, Connor Hampson, James Jones (Ben Harrison, 46), Tom Hannigan, Jake Moult, John Johnston, Simon Richman (Sean Williams, 55), Jordan Hulme, Josh Hancock, Max Harrop (Nathan Waterston, 68).